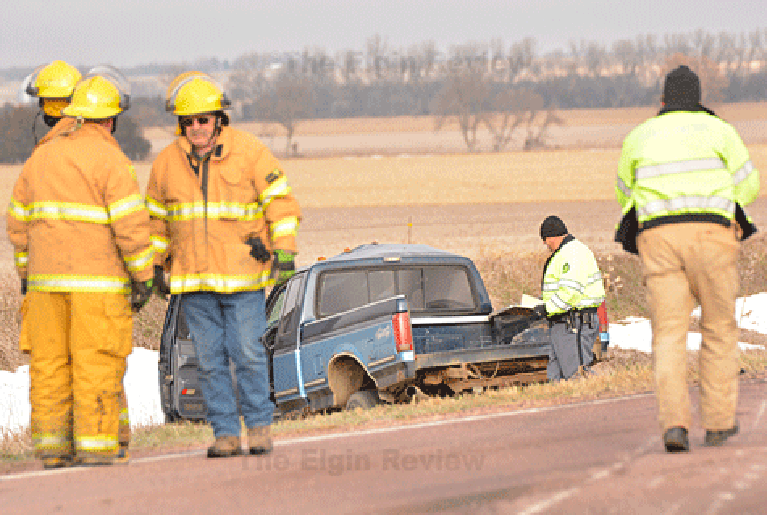 A two-vehicle accident north of Elgin Friday morning claimed the life of a South Dakota man. Acting Antelope County Coroner Joe Smith said Drew Holter died as a result of injuries sustained in the accident at the intersection of 841 Road and Highway 14. The accident occurred around 9:45 a.m.
Holter, 24, of Platte, S.D., was headed eastbound on 841 Road when he collided with a semi-trailer truck heading north on Highway 14. The semi-trailer truck was being driven by a Clearwater man, 64-year-old Roy Rogers. Rogers was taken by Elgin Ambulance to Antelope Memorial Hospital. The semi-trailer truck struck the passenger side of Holter’s pickup. According to the Nebraska State Patrol, Holter was not wearing a seatbelt at the time of the accident. The accident remains under investigation by the State Patrol. Smith said Friday afternoon that an autopsy on Holter will be conducted Saturday in Omaha. Holter, living northwest of Elgin, was a wind turbine technician at Invenergy LLC in Elgin. Traffic was stopped for a period of time as a result of the accident.